10th July 2017 | filed under Botox. Anti-Wrinkle Injections have long been the single most popular aesthetic procedure used to treat wrinkles around the facial area. At The Aesthetic Skin Clinic, our anti-wrinkle injections are designed to treat facial lines and furrows with wrinkle injections, which work to relax the facial lines. But did you know anti-wrinkle injections are used for much more than to treat wrinkles? Our anti-wrinkle treatment in Belfast, Guernsey, and Jersey can help. This procedure is used for many other reasons, here we will take a look at just some of these. In 1992, Dr. William Binder observed that when he gave people the injection for wrinkles, they reported fewer headaches. In 2010, the FDA approved Botox to treat chronic migraines in adults, stating the injections were shown to be an effective migraine prevention. Migraines are intense pulsing and throbbing of one area of the head, which may be accompanied by nausea, vomiting and sensitivity to light and sound. To treat the distress, anti-wrinkle injections are injected every 12 weeks around the head and neck. Hyperhidrosis is the common medical condition where a person sweats excessively. In some individuals, a hypersensitivity of the glands produces excessive sweat production. Between 1-3 people in 100 live with the condition in the UK alone. This condition can be embarrassing and cause distress, but it can be managed successfully. With small doses of anti-wrinkle substance injected into the skin, they block nerves that supply the eccrine glands, which prevents the glands from producing sweat. 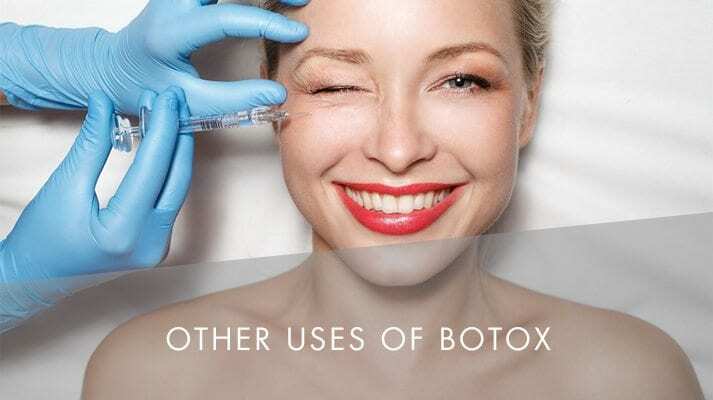 There are a number of helpful, successful treatments for this condition, and at The Aesthetic Skin Clinic, we believe anti-wrinkle injections are a highly effective, proven, and safe way of controlling symptoms. Severe incontinence is the uncontrollable urge to urinate, which affects 17% of women over the age of 45, and 25% of women over the age of 75. It reduces the frequency and urgency of needing to go to the toilet, and reduces urinary incontinence in 75% of women who undergo the injection. Those who used the anti-wrinkle procedure feel a greater reduction in symptoms, and a higher satisfaction with the treatment. In the US, anti-wrinkle injections are approved to treat muscle spasms in the eyelids, face, neck, shoulders, and upper body. Anti-wrinkle injections are a nerve impulse blocker, working by attaching to nerve endings, preventing the release of chemical transmitters, which activate muscles. Anti-wrinkle injections blocks the message from the brain that tells the muscles to contract, meaning the muscle doesn’t spasm. This treatment may need to be repeated every three months as nerve endings grow new connections. Anti-wrinkle injection treatment is an effective method of reducing symptoms of the distress caused by the above conditions. Here at The Aesthetic Skin Clinic, we are home to an award-winning team of innovative and respected cosmetic doctors, surgeons, dermatologists, and aesthetic nurses, who carry out our advanced treatments to the highest standard. We provide the best possible care and service to all our clients, including anti-wrinkle injection in Belfast, Jersey & Guernsey. If you suffer from any of the mentioned conditions, or would like to find out more about the treatments we provide, please don’t hesitate to get in touch with a member of our team today.